A lot of effort goes into providing stallions with safe yards, boxes and work environments and justifiably so to protect them from external injuries. But what about internal problems? You only have to Google ‘stallion dies colic’ or ‘stallion dies laminitis’ to realise just how many stallions have been lost over the years to nutrition related diseases. And look in almost any feed room at a stallion barn and you will find a host of supplements for hoof problems. It stands to reason then that providing a ration that will reduce the risk of colic and laminitis and keep hooves healthy is equally as important as the safety of a stallion’s external environment. 1. Feed plenty of fibre - Most stallions get some turnout time, but when they are in their boxes they should be given access to as much grassy/pasture hay as they want. Some lucerne hay can be fed but avoid feeding only lucerne hay as this can cause its own set of issues. If you have a fussy or distracted stallion that won’t eat hay, use chaff instead, being careful to weigh and feed chaff amounts accurately (a 2L dipper of chaff weighs ≈ 250 grams). Broad recommendations suggest that a horse should be fed a minimum of 1 kg of forage for every 100 kg of bodyweight but the more forage you feed the safer a diet will be, so feeding closer to 2 kg of forage (hay or chaff) for every 100 kg of bodyweight (12 kg/day for a 600 kg stallion) is where I would be aiming for a stallion receiving very little turnout time. 2. Keep an eye on water intake – Some horses aren’t good drinkers all of the time while other horses may temporarily stop drinking due to illness, pain, electrolyte deficiency or a problem with the taste or temperature of the water. Whatever the cause, dehydration is a major risk factor for colic and as such water intake should be closely monitored. Where automatic waterers are used a flow meter should be considered. If you notice a horse isn’t drinking try to isolate the cause and do everything you can to get water intake back to normal as quickly as possible. Where there is no obvious cause, additional salt can be added to the ration to increase a stallion’s thirst response and subsequent water intake. 3. Feed Cooked Grains – Anything that disrupts the fine balance that exists in a stallion’s hindgut between populations of good and not so good bacteria puts that horse at risk of colic. Feeding whole or crushed cereal grains like barley or corn to stallions will see large amounts of undigested starch being delivered to the hindgut which in turn results in the production of excessive amounts of volatile fatty acids, lactic acid and gases, all of which can lead to colic. Feeding grains that have been cooked (extruded, micronised or steam flaked) ensures the grain starch is digested in the small intestine where it should be digested and keeps the hindguts ‘balance’ in check. 1. Feed Cooked Grains – As discussed above, feeding whole or crushed cereal grains including barley or corn to stallions causes large amounts of undigested starch to be dumped into the hindgut where it is rapidly fermented by bacteria. This rapid fermentation causes a build up of volatile fatty acids and lactic acid. These acids drop the pH within the stallion’s hindgut and lead to a condition known as hindgut acidosis. Stallions with hindgut acidosis are at risk of developing sub-clinical or acute laminitis. Cereal grains with the exception of oats should NEVER be fed to a stallion uncooked. 2. Control body fatness – Stallions that are overfed and become overweight may develop a condition known as insulin resistance where their body needs to release massive amounts of insulin to keep blood glucose levels under control. It is now known that higher than normal levels of insulin are a cause of equine laminitis. To prevent insulin associated laminitis, stallions should be kept active, fit and in good but not excessive body condition. 1. Feed plenty of forage – The bacteria in a stallion’s hindgut are largely responsible for producing the B-vitamin biotin which is needed for good hoof growth. To maximise biotin production, the bacteria in the hindgut need to have access to plenty of forage (fibre) to ferment to allow them to produce biotin. As discussed above, you should aim to feed up to 2 kg of forage (hay or chaff) for every 100 kg of bodyweight (12 kg/day for a 600 kg stallion) for a stallion receiving very little turnout time. 2. Feed cooked grains – again this is important! Feeding uncooked grains disrupts the populations of bacteria in the hindgut that are responsible for biotin production so if you feed uncooked grains and cause any level of hindgut acidosis, biotin production and hoof health can be negatively affected. 3. Feed high quality protein – Strong hooves rely heavily on a good source of essential amino acids and particularly methionine. Choose feeds for your stallions that are based on high quality proteins that are naturally high in methionine like black sunflowers (8.8 g methionine/kg) and soybean (6.5 g methionine/kg). Some stallions are more prone than others to colic, laminitis and/or hoof problems. These stallions need to have their diets closely managed and would benefit from being fed a high fibre, grain free ration. Grain free diets reduce the risk of colic and insulin related laminitis, they remove the risk of hindgut acidosis related laminitis and help to improve hoof quality in stallions struggling with hoof problems. Stallions with hoof problems may also benefit from additional biotin supplementation. Grain free diets also benefit highly strung stallions as they tend to help keep them a little more ‘together’ mentally and they can be safely used for stallions prone to tying up. Grain free diets should use high energy fibres like lupin hulls, unmolassed sugarbeet pulp, soybean hulls and high quality vegetable oils in place of the more traditional grains and grain based feeds used in most rations. 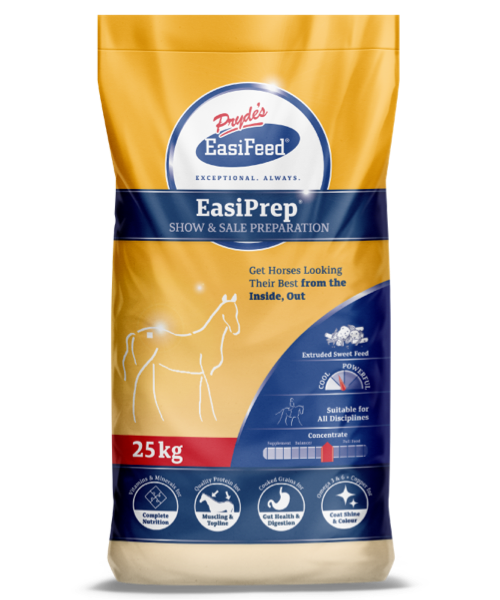 Manage your stallion rations carefully, ensuring they contain well cooked grains, high quality protein and LOTS of forage and keep a close eye on water intake and body condition to dramatically reduce the risk of an ill-fate caused by colic, laminitis or hoof problems. While a stallion can be lucky and recover from these problems, prevention is always better than cure when it comes to keeping stallions ‘safe and sound’. The Pryde’s EasiFeed range of quality feeds includes EasiPrep Concentrate (an extruded grain based sweetfeed concentrate with high quality protein and black sunflowers), EasiSport (a non grain complete feed based on lupins hulls and soybean protein) and Polished (a biotin, methionine and organic mineral hoof and coat supplement) giving you a complete feed range that can cover your stallion needs. These feeds provide you with safe, high quality options that will reduce your stallions’ risk of colic and laminitis and help to correct hoof problems. Pryde’s recommend the following diet for breeding thoroughbred stallions not at increased risk of colic or laminitis. These diets are formulated based on a 600kg stallion covering up to 100 mares per season. 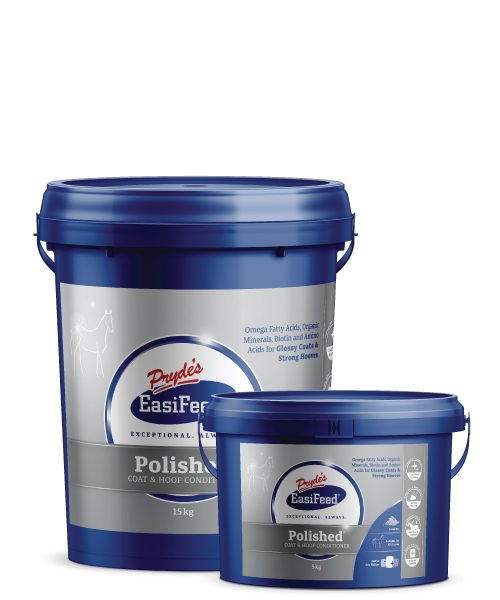 Stallions with hoof problems can have 150g / day of Pryde's Polished added to their diet. Breeding stallions are individuals so for a full assessment of your breeding stallion needs and a custom diet formulation, contact Pryde’s EasiFeed on 1300 732 267 or email info@prydes.com.au.